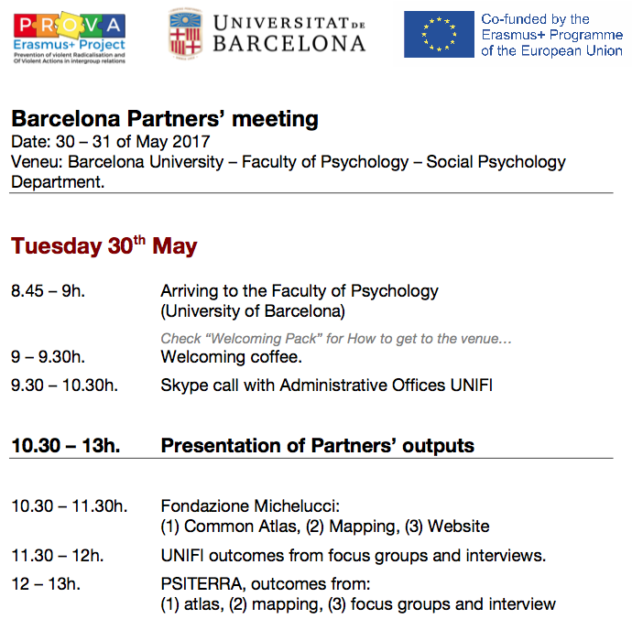 On May 30-31, 2017, the Faculty of Psychology in Barcelona welcomed the PROVA project partnership and its second international meeting. After the greetings, there has been a Skype call with Administrative Offices of UNIFI, and each partner had clarification about financial aspects, bureaucratic rules, and deadlines. 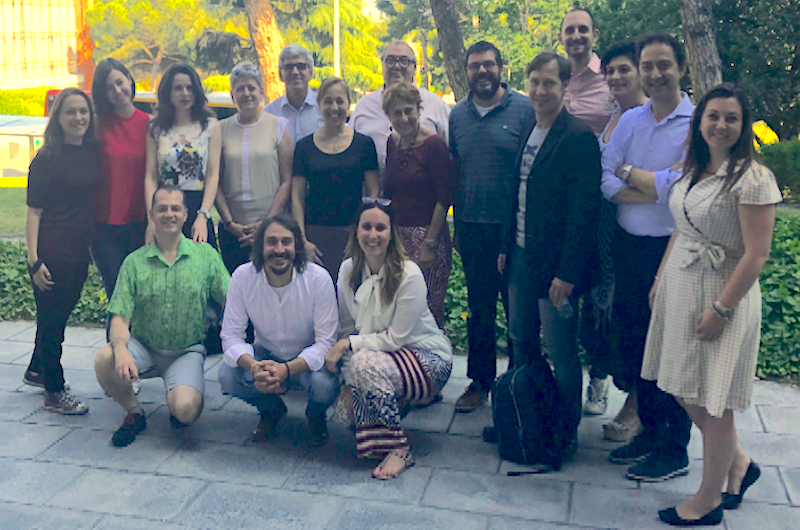 Following, each partner updated the others on the outcomes and the results gained in the project activities: atlas, mapping, focus groups and interview. 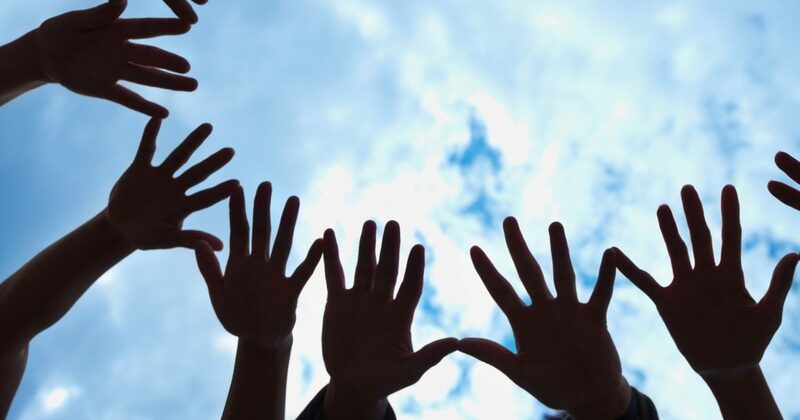 The Fondazione Michelucci illustrated the communication and dissemination strategy, particularly on the website. 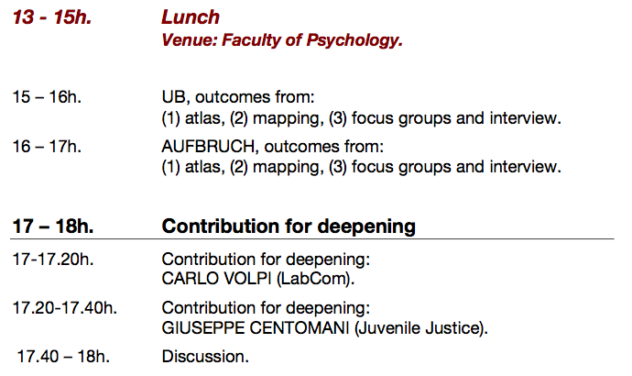 In conclusion, there were two contributions for deepening: one by Carlo Volpi (LabCom) and the other one by Giuseppe Centomani (Italy Juvenile Justice – associate partner). The day ended with a discussion based on the suggestions born thanks to these contributions. The second day started with the documentary “A dentro” (inside)” by Ruido Association and three other significant contributions for deepening by MARTA VENCESLAO (University of Barcelona) on Minors under criminal proceedings processes, by ANDRES Di Masso (University of Barcelona) on Thematic Analysis, and by Pilar Eras (Director of Juvenile Justice at Catalonia Government). 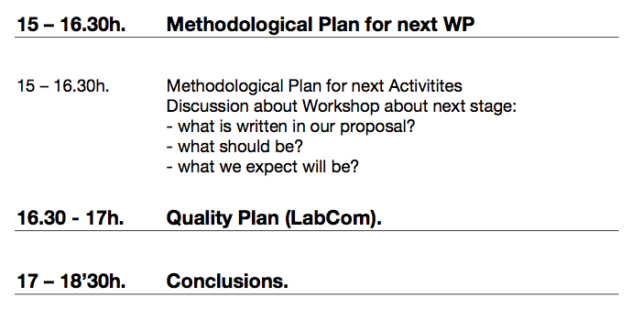 In the afternoon the Coordinator shared with the partnership the Methodological Plan for next Activities, and then LabCom illustrated the Quality Plan). The days were busy with activities but also of shared moments with superb meals… great memories and good energy.